Bankruptcy is a major area of the comprehensive legal services offered by Jim Williams & Associates to our clients in Tennessee and Virginia. We know financial problems can create significant stress on individuals and families. We also know that the timely resolution of financial matters relieves stress and anxiety. This is why we diligently work with clients to achieve a timely resolution of financial issues through the bankruptcy process. Many good people find themselves facing bankruptcy through no fault of their own as the result of a divorce, loss of job, death of a family member, business failure or loss, or other unforeseen circumstance that has left them in dire financial straits. U.S. bankruptcy laws are not intended to punish citizens for financial problems. They are designed to protect both debtor and creditor and give you the opportunity for a fresh start. Many families facing bankruptcy are afraid that they will not qualify, but this is simply not the case. Our attorneys and staff will guide you through the bankruptcy process and advise you as to the type of bankruptcy you qualify for. While a person may be eligible to file bankruptcy, there are limits placed on individuals who have previously filed bankruptcy. Typically a Chapter 7 bankruptcy can be filed every eight (8) years. Under Chapter 7, the debtor receives a discharge of all dischargeable debt usually within four (4) months from their meeting of creditors. In the majority of Chapter 7 cases, the debtor loses no assets and gets a fresh start without retaining the overwhelming burden of debt they now carry. Additionally, under Chapter 7, you can protect, or keep, certain assets under existing federal and state law exemptions. For those individuals not eligible for a Ch. 7 bankruptcy due to income requirements, or those who wish to maintain their home or other large asset that is not protected by exemptions, a Chapter 13 bankruptcy is always an option. If you are behind on your mortgage and want to make up missed payments over time and reinstate the original agreement, a Chapter 13 bankruptcy may be for you. Under a Chapter 13 bankruptcy, you may be able to keep all of your assets, assuming you can afford to do so, by repaying your creditors over time as you currently do. A Chapter 13 is an option for those who have never filed bankruptcy as well as those individuals who previously received a discharge under Chapter 7, 11 or 12 more than four years ago. A Chapter 13 is also an option for those individuals who have tax debt, which makes up a large part of their overall debt. Bankruptcy is a difficult decision that should never be taken lightly. 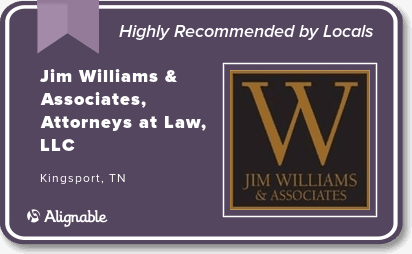 Jim Williams & Associates has helped numerous families and businesses throughout Tennessee and Virginia protect assets and avoid financial disaster by filing bankruptcy. From our downtown Kingsport, TN office located at 324 Cherokee St. Our attorneys and staff are well prepared to guide you through the process of filing bankruptcy and/or resolving a bankruptcy issue. Fill out our Bankruptcy Intake Form and we will contact you to discuss your case.